The center channel is the most important component of a surround sound system, but it is often overlooked. In fact, it produces more than 60 percent of all soundtrack materials. 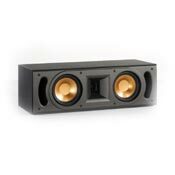 Klipsch certainly gives the new RC-25 center channel the attention it deserves by incorporating new features that enhance performance and installation flexibility. This detailed performer establishes a new value price point in the Reference Series line by continuing to offer phenomenal sound and stylish flair, but at an even more affordable price. The RC-25 delivers precise, subtle and exhilarating sounds through dual 5.25-inch woofers and a 1-inch tweeter that has a light titanium-dome diaphragm and a high-energy, video-shielded Neodymium magnet. The tweeter is coupled to an exclusive Klipsch square TractrixÂ® Horn that boosts the driverâ€™s already high sensitivity while minimizing room interactions that cause loss of sonic detail. Ok first off to the bad reviews.... Please learn how to adjust your signal properly before laying a bad review on a specific model and for gods sake if you label a brand insufficient because of your lack of ability stay off a review site altogether..
My receiver was a Yamaha rx-v630,with this receiver my system was lifeless and way too bright,so in comes my Marantz SR18U and wow!! The depth and the clarity is mind boggling!! In 5.1 the RC 25 is brilliant,very detailed,voices are crisp,mids are punchy. The soundstage this center presents with its siblings are bar none. Give this center a try with a decent signal,proper adjustment,and in the midst of equal quality gear and you will achieve listening nirvana. You people are running a poor amp and receiver. OPEN your wallet and let the music shine!! I bought this speaker in 2005, I am using a SR7500 Marantz receiver. Even though I have owned this speaker for quite some time, I have never been completely satisfied with it. When watching football games, the crowd noise seem to drown out the announcers, when watching movies the actors sound like they are speaking from inside of a box. My fronts are the RF3 tower Klipsch speakers, my rears are Klipsch speakers as well. I am currently shopping for a new center speaker, I'm pretty sure that it won't be a Klipsch, but, it will have to be compatible with what I already have. My RF3's are awesome, I just need something to compliment them. Tons of power, crisp sound, great range. Will need to be balanced with remaining speakers. Excellent clarity and ballance of bass/treble for a center speaker. Purchased from www.acousticsounddesign.com. An affordable, knowledgeable reseller of audio equipment -- including Klipsch speakers. Cheap sounding, nasal, shut in, no dynamics, only for budget systems. The price mentioned is in Euro's, that's about 360.00 Dollar (it's expensive because of import into Europe etc.). I wanted a front ported center speaker, because of placement low in front of my plasma tv. Its back was 6" clear of the tv, placed on 3 rubber studs, with both sides free in space. After reading the reviews, I thought this speaker would be a good choise for me, but it was a total let down. It might be alright in a budget system, but in any mid. or high priced system with floor standing speakers, it falls totally short in all aspects. I've tried the amp. setup for the speaker on both Large and Small, with Small sounding 'best'. The spoken sound was nasal and shut in and degraded the surround sound totally. I get far better results with my amp. set up on: 'Without center speaker'. Klipsch RC-7 (It's too big in my new set up, so I had to sell it). Good Bass Response, Solid build and placement options. Lacks Treble refinement and can sound harsh with a bright sounding receiver. It’s been a week since I got this speaker and would have used it for about 10 hrs. I have connected it to Denon AVR-1803.The speaker handles the voice part pretty well and is quite clean when it comes to that. Some vices do get a bit bright and I guess my receiver is also on the brighter side. When it comes to music I think the treble isn’t all that refined. So what I tried was, disconnected all my other speakers and tried this one with just multichannel music. I previously owned a Sony speaker which I got from Japan some 5 years back and I can see some serious difference between them. The Klipsch certainly was louder and produced a clear voice. Not to mention the strong bass it could produce. But the treble part was not all that great compared the old Sony which is a 4 way speaker. Using it in 5 channel stereo revealed this all the more. Probably this speaker can sound better with a better receiver but for my receiver I think it certainly lacks treble range for my taste. Others might see this speaker in a different light and like it more than me but this is all about my opinion. I’ve been doing some research about the break in time for the speakers and they say it sounds better after 100 hrs of break in time. I’m going to give that a try and see if it sounds better after such time. I don’t think treble would improve after break in because I own a pair of Paradigm M9 for my fronts and the rebel for that became much smoother after a while and not more than what it was originally. If anyone thinks am crazy to compare Sony with Klipsch, let me tell you this, ive been a sound maniac all my life and I know what am listening to is good or bad, detailed or just colored. If there is anyone who has compared the Klipsch RC-25 with Paradigm procenter C2, please let me know cause I think that sounds better that this on all fronts. I have listened to it some time back. The shop dealer did not have stock of it when I went to buy it and I ended up buying the Klipsch. For comparison try to disconnect other speakers and listening cause in multi channel mode you wont quite know how exactly the center is doing besides the voice part, other speakers will fill cloud you hearing. I also tried connecting this as a main speaker having everything else disconnected and the difference in the treble was all the more obvious. If anyone thinks am wrong about the way am reviewing this, please correct me. Great sound, great appearance, great value. I bought these speakers off of ebay. I was a bit skeptical but I had read good reviews on these. I must say the reviews are right! The sound is crisp and clean. They have a true presence and add a great demention to your soundstage. I would recommend these to anyone! Purchased the Klipsch RC-25 center speaker and just love it,what a tremendous improvement,a joy to my overall listening pleasure. Highly rated...if you don't want to spend a fortune and love quality this is a must. The warm sound, if you are open mined enough to give it a chance. The efficiancy is great on this speaker and it has a nice clean look. After deciding that it was important to have a matched system, the first thing I had to do was decide on a brand. This was easy after owning Klipsch KG 4’s in the past. This the hardest part began. Deciding the value to performance ratio is always hard and especially with Klipsch. The RC-25 was going to be used in a medium-large room with a funny shape. It is harder to fill my room with sound than a normal box shaped area. The RC-25 is defiantly been up to the challenge. After the “break in” period this speaker really starts to shine. (The break in period to me is getting used to the Klipsch horn) The warm sound and nice detail is evident after having a low budget center for the last two years. The RC-25 fills the listening area nicely and it is letting me hear dialog I was unable to hear clearly before. I am very happy with this choice. i have a medium sized living room and decent home theater set up. i am in the process of building it, but donth ave the cash to do it all at once. anyway, the rc-25 fits my system perfectly. it blends beautifully with my marantz floor speakers and i have 2 rs-25's as my surrounds. for the total price i have put into my system (under a $1000), it sounds pretty damn good.